In April 2015, the total retail sales of consumer goods reached 2,238.7 billion yuan, up by 10.0 percent year-on-year (nominal growth rate. The real growth rate was 9.9 percent. The follows are nominal growth rates if there’s no additional explanation). Of the total, the retail sales of consumer goods of units above designated size was 1,056.4 billion yuan, increased 6.7 percent. From January to April, the total retail sales of consumer goods reached 9,310.2 billion yuan, up by 10.4 percent year-on-year. Of the total, the retail sales of consumer goods of units above designated size was 4,301.5 billion yuan, increased 7.5 percent. In terms of different areas, the retail sales of consumer goods in urban areas was 1,934.8 billion yuan in April, up by 9.8 percent, year-on-year; while that in rural areas was 303.9 billion yuan, up by 11.4 percent, year-on-year. From January to April, the retail sales of consumer goods in urban areas was 8,005.6 billion yuan, up by 10.2 percent year-on-year; while that in rural areas was 1,304.6 billion yuan, up by 11.5 percent. In terms of different consumption patterns, the catering services in April gained 232.7 billion yuan, up by 11.7 percent, year-on-year. 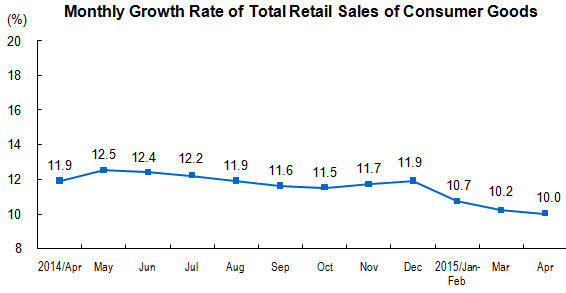 The retail sales of goods gained 2,006.0 billion yuan, up by 9.8 percent. From January to April, the catering services gained 978.5 billion yuan, up by 11.4 percent, year-on-year; the retail sales of goods gained 8,331.7billion yuan, up by 10.3 percent. The retail sales amount of goods of units above designated size in April was 993.9 billion yuan, up by 6.7 percent year-on-year. From January to April, the retail sales amount of goods of units above designated size was 4,045.7 billion yuan, up by 7.5 percent year-on-year. From January to April, the national online retail sales of goods and services was 1,043.5 billion yuan, increased 40.9 percent year-on-year. Of which, the online retail sales of goods was 869.0 billion yuan, increased 40.3 percent, accounting for 9.3 percent of the total retail sales of consumer goods; the online retail sales of services was 174.5 billion yuan, increased 43.9 percent. Of the online retail sales of goods, the food, clothing and other commodities went up by 48.2 percent, 32.4 percent and 43.4 percent respectively. Online Retail Sales of Goods and Services: refers to the sales of goods and services got through public online trading platform (including self-built websites and third-party platform). Online retail sales of goods and services = online retail sales of goods + online retail sales of services. The total retail sales of consumer goods includes online retail sales of goods, excludes online retail sales of services. 5. Data of the total retail sales of consumer goods in 2013 was revised according to the results of the Third National Economic Census, and data of the total retail sales of consumer goods in 2014 was adjusted accordingly.